BOGOTA, Jun 6 2018 (IPS) - Colombia is a global power in biodiversity and water resources, but at the same time it depends on exports of fossil fuels, coal and oil, to the world. But don’t panic: in the green economy there are also incomes and jobs – says a world expert on the subject, Juhern Kim. “If Colombia makes intelligent use of its abundant natural resources, its natural capital, it can create new business opportunities linked to bio-economics, sustainable agriculture and forestry, which have the potential to generate income and create green jobs,” Kim, an environmental economist and ecosystem management specialist, told IPS in an interview. Kim is acting representative in Colombia of the Global Green Growth Institute (GGGI), an intergovernmental organisation created in 2012, which promotes sustainable development that is both economically viable and socially inclusive. It works directly in 26 countries, including Colombia. In June last year, Colombia ratified the Paris Agreement on Climate Change, by which it pledged to reduce greenhouse gas emissions by 20 percent by 2030, to help fight global warming. Among other issues, Kim analysed in his interview with IPS how this South American country is moving towards climate change mitigation and adaptation and a low-carbon economy, as committed to in the climate agreement signed in December 2015 in the French capital, at the 21st Session of the Conference of the Parties (COP 21) to the United Nations Framework Convention on Climate Change. The expert, who previously represented the GGGI in Vietnam and worked on issues related to the green economy at the UN Environment, also analysed how Colombia can make its energy mix and its economy greener in general. IPS: Colombia is the world’s fifth largest producer of coal. How does the GGGI suggest bringing about an end to mining, an activity that runs counter to the climate accords? 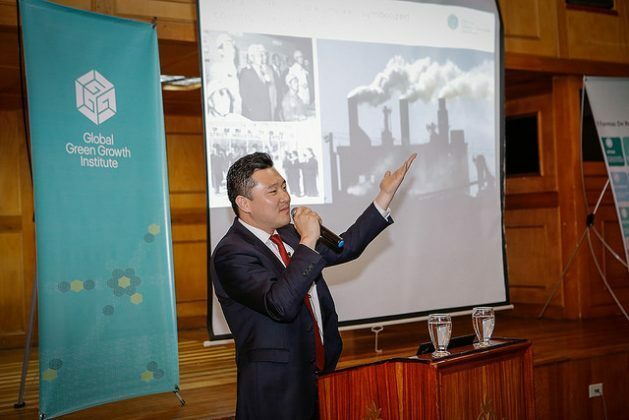 JUHERN KIM: Coal production plays an important role in the Colombian economy: it contributes around 1.5 percent of GDP and 18 percent of total exports. Since about 95 percent of the coal produced in Colombia is exported, national coal production is affected by international market trends. The recent volatile price fluctuation for commodities, and the associated impact on the Colombian economy, clearly shows that the country’s economy needs to be diversified in order to grow more and better. Furthermore, future global demand for coal will tend to fall, although it will happen progressively and not for all types of coal. Many countries have started to shut down their coal plants, and have been working on reducing the consumption of other fossil fuels, reinforced by international commitments such as the Paris Agreement, where Colombia made its own commitment as well. GGGI promotes a sustainable and inclusive economic growth path, which implies the reduction of coal and other fossil fuel use, due to the negative environmental impacts. 1. Incorporation of renewable energy in the energy mix. GGGI advocates for countries to achieve energy transitions towards cleaner technologies. In Colombia, the production of electricity from coal amounts to 8 percent of the total. 2. Exploring new economic growth drivers to diversify the economy currently depending on the mining-energy sector (oil and coal exports). For instance, Colombia has abundant resources associated with natural capital, such as biodiversity – if Colombia utilizes these resources wisely, they can create new business opportunities related to bio-economy, sustainable agriculture, forest economy, which have the potential to generate income and create jobs (green jobs). 3. Curbing the environmental impacts of coal mining, especially by informal miners. Coal mining has informality rates close to 40 percent, while many productive units do not have an environmental license and have exploitation techniques that are harmful to the environment. It is intended to strengthen the mining formalization and provide technical assistance to reduce pollution. IPS: How can the coastal population be protected from the intensification of tropical storms and the advance of coastal erosion? JK: Colombia is being highly threatened by tropical storms and coastal erosion in two coastal areas that represent nearly 1,700 km in the Caribbean and 1,300 km in the Pacific. Colombia has coasts on two oceans, and the frequency and intensity of such extreme events have been increasing, which, added to the deficient planning of urban development, increases the vulnerability and risk of people, infrastructure, and ecosystems. The National Adaptation Plan recognises the country’s vulnerability to this type of events. The country is now moving in the right direction led by the Ministry of Environment and Sustainable Development (MADS) by including climate change variables within the planning and zoning of the territories, which will be articulated with adequate financing and technology transfer to implement mitigation measures for this type of risks. Of particular importance is the ecosystems-based adaptation measure. In this case, protecting and increasing the mangroves on the coastal lines will reduce coastal erosion, and at the same time allow the sustainable use of this type of ecosystem for the benefit of local people’s livelihood. In other cases, it will be necessary to implement traditional infrastructure measures that avoid short-term calamities. Increasing local capacities, public awareness, adequate planning and the implementation of risk mitigation measures are key to achieving this objective. IPS: A key question is the energy transition. How can clean energy be promoted in Colombia? Is community self-management better, or are large regional concessions, criticised as monopolies, preferable? JK: Colombia has a high proportion of clean energy from hydroelectric generation (70 percent). However, this energy depends on the hydrological cycle which makes it vulnerable to the effects of climate change. In that sense, it will be beneficial for Colombia to diversify its energy mix with other sources of clean energy, with some policy changes and regulations in the wholesale energy market. Colombia currently lags behind in terms of the production of non-conventional renewable energy resources, compared to neighboring Latin American countries like Chile. However, Colombia has a strong potential for generation of solar, wind and biomass energy, and those can also serve as alternative off-grid solutions. We believe that renewable energy projects should be carried out by entities that have the right technical and financial strengths required to develop, operate and maintain this type of projects. IPS: What does the GGGI think of fracking? JK: Fracking, like any other exploitation technique, has associated risks in its implementation and management, as it is known for generating many environmental impacts, such as potential contamination of ground and surface aquifers, methane emissions, air pollution, etc. In addition, it also has a potential for increasing oil spills, which can harm soil and surrounding vegetation. In general, as an institute dedicated to green growth, we promote the development of alternative renewable energy sources to reduce dependence on fossil fuels. As mentioned above, it would be expected that the government make some efforts to diversify their economy to generate new sources of economic development while taking care of the environment and social impact. IPS: According to environmental analysts, when the FARC (Revolutionary Armed Forces of Colombia) withdrew from the territories it controlled, it became evident that the guerrillas had played a role as forest rangers in those areas, because thousands of hectares have been razed since then. What is your take on the situation and what do you think can be done? JK: Although the presence of guerrillas in many forested zones of the country prevented the entry of agricultural expansion and exploration for natural resources in some sense, it is probably not that simple to say that they played a role as forest rangers, because they also supported the production of illicit crops that generated deforestation. In brief, understanding the reasons for the increase in deforestation in the country is not simple math at all. And finding solutions is not simple as well. It seems that the post-conflict process has been generating a change in the territorial dynamics, in some cases through an absence of control arguably provided by guerrillas in the past, in other cases through a high-level of speculation associated with unproductive land use, with false hope embedded for some people wanting to be awarded land titles if they put any type of activities in the land, and sell their land at a better price in the future. The playing field must be levelled. The abovementioned situation prevents rural producers and entrepreneurs from accessing land with adequate support for productive activities and conservation incentives, such as credits (i.e. financial instruments), access to markets, financial incentives for conservation (e.g. payment for ecosystem services), and so on. In fact, the whole landscape should be properly planned in an integrated way – i.e. sustainable landscapes approach, which promotes economic gains but minimising environmental impact and increasing social returns. For instance, productive zones for local economic development should be set up, but it is not wise to set them in the biological corridor. Also, financial instruments designed to promote sustainable agriculture methods, such as agroforestry, can be a driver for making a sustainable transition. Also, Colombia has defined an Integrated Strategy for the Control of Deforestation and Forest Management, which sets clear guidelines on how to address this issue. However, having this strategy is not enough if there is no tight alliance among Colombian society as a whole. In addition, the public authorities have an important role to play to implement the vision for conservation of forests (i.e. command and control) – e.g. functions of the prosecutor offices, judges and many other actors, committed to reduce illegality.